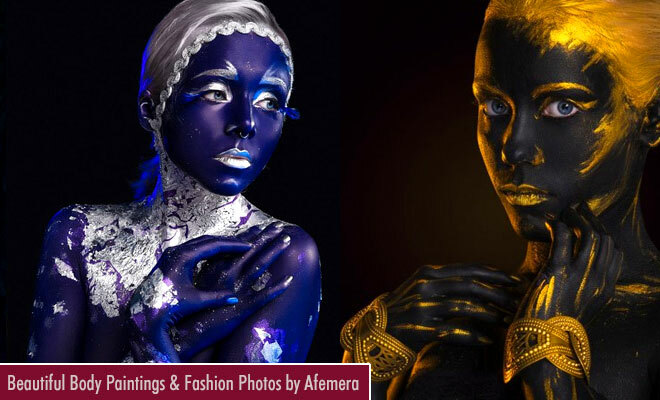 Afemera is a make-up artist and photographer from Russia. She loves to play with light and you can see the various shades of blue, silver and gold as body art on models and they look real stunning. Her portrait photography of people modelling as a bride, Geisha makeup, scientist are so stunning. What kept us mesmerised was her body art of an elf with a human face and animal like features. It definitely reminds us of the beauty and the beast, except in this elf body art, it's all the same person. According to Afemera, "See what I see. Feel what I feel. Save as I save. Judge as I judge" - a simple way of life. Irina Shalagina is popularly known as Afemera in the art industry and she has cause quite a ripple with her stunning cosplay photography and body painting art ideas.